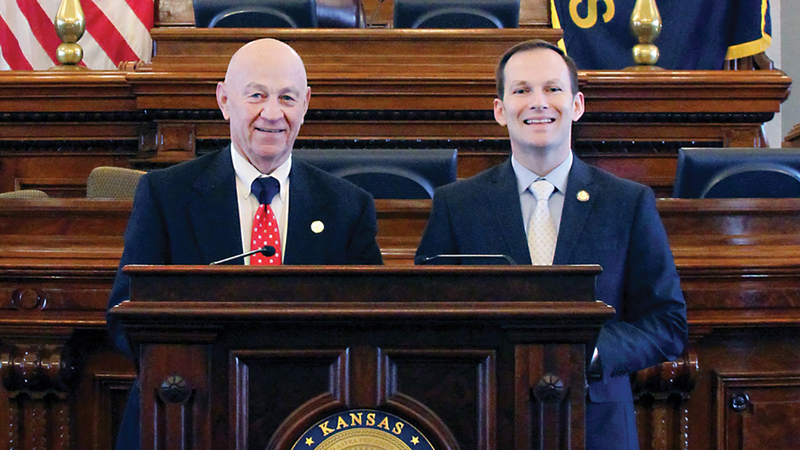 [Episcopal News Service] Kansas state Reps. Brandon Whipple and Lonnie Clark would seem at first glance to have little in common. Whipple is a young Kansas transplant with a growing young family, and Clark is a retiree who grew up in the state. Their differing backgrounds extend to their politics: Whipple is a Democrat and Clark is a Republican. But the two men have a faith connection. Both are Episcopalians and are thought to be the only two in the part-time Kansas Legislature. Each joined the Episcopal Church in recent years, and each says his religious values inform his political stances, sometimes in subtle ways and sometimes overtly. “From my standpoint, at least my philosophy on Christianity and me being a Christian, I try to treat everybody fairly whether I’m in the House of Representatives or with my neighbor,” Clark said in a phone interview with Episcopal News Service. Clark, 73, worked as a health care administrator and a Homeland Security trainer until his retirement. He has several grown children and young grandchildren and lives in Junction City, where one of the top political issues is preserving jobs at the nearby army base, Fort Riley. Whipple, 34, represents a district in Kansas’ largest city, Wichita, and was an adult when he adopted the state as his home on his way to earning a doctorate in leadership studies. He teaches college part time, and he and his wife have two young sons, with a third child on the way. Clark and Whipple work on opposite sides of the aisle in a state where Republicans control the Legislature and the governorship, but they found themselves on the same side of a high-profile vote June 6, succeeding in overriding Gov. Sam Brownback’s veto of the state budget. Brownback’s tax cut plan had drawn bipartisan criticism for failing to deliver robust economic growth, and Republicans joined with Democrats in rolling the cuts back. The 2017 legislative session concluded later that month. The pair of legislators also connected over their shared Episcopal faith after they were featured in a joint profile in the Diocese of Kansas’ newsletter. Religion has become an easy conversation starter. Clark’s Christian values originate in the Baptist faith of his childhood. That faith carried him into adulthood, but he later converted to Roman Catholicism, partly because of the Catholic chaplains he met while he was a soldier serving in Vietnam. After returning home from the war, his career moved him around the country, from Des Moines, Iowa, to Birmingham, Alabama. He retired in 2004 but later went to work for the Department of Homeland Security training air marshals. He eventually moved back to Kansas and retired for good. Clark’s first marriage ended in divorce, and when he returned to Kansas, he met the woman he calls the “love of my life,” a former high school sweetheart whose first husband had died. She is a lifelong Episcopalian, and they married in an Episcopal church in 2015. He cites that belief, though, as helping him see people as more than Republicans or Democrats. “I think my faith is kind of the reason that I’m able to work across the aisle,” he said. Whipple was first elected to the House in 2012. Now in his third two-year term, he holds a position on the Democratic leadership team, as agenda chair. He attends St. James Episcopal Church in Wichita. Whipple grew up in New Hampshire. It wasn’t until high school that he felt drawn to a faith tradition. A friend of his had an uncle who was a Roman Catholic priest, and they attended the uncle’s church together. Whipple was baptized at age 17 and later confirmed into the Roman Catholic Church. As a college student, he volunteered to spend a year in Kansas working with at-risk children through AmeriCorps. He fell in love with the state and decided to stay after the year was up, transferring to Wichita State University. His wife, whom he met in Kansas, was raised Roman Catholic, and they attended a Catholic church in Wichita for a while. They ended up in the Episcopal Church partly because of politics, Whipple said. A priest at the Catholic church that they had been attending sometimes included partisan views in his homilies, Whipple said. He was most bothered by the priest’s implication that Republicans were more authentically Christian than Democrats, a message also heard in ads by a Kansas lobbying group that claimed it represented Catholic interests, Whipple said. “They were wrong. They were painting all the Democrats with a particular brush,” Whipple said, adding that he maintains a deep respect for the Roman Catholic tradition. “Separating church politics and party politics was kind of our goal, while still being able to maintain our values,” Whipple said. Like Clark, Whipple said he doesn’t often wear his Episcopal faith on his sleeve, though he put the church’s values front and center when he spoke out earlier this year against a proposed state moratorium on refugees. Amid an intense parallel debate at the federal level over the Trump administration’s policies toward refugees, the Kansas moratorium bill advanced out of a House committee in March, but it stalled after concerns were raised by legislators, including Whipple. “We as a nation are distancing from the politics of reason to the politics of fear,” Whipple said, according to an Associated Press report. Clark voted in favor of Whipple’s amendment seeking to protect the resettlement work of religious organizations, though the amendment was defeated. The bill was referred back to the committee, where it died. “I felt this bill would challenge a deeply felt religious belief, that we should be an open society to people less fortunate around the world,” he said, and he was proud to cite the statements of Kansas Bishop Dean Wolfe in support of continued refugee resettlement. Wolfe, who left Diocese of Kansas this year to become rector of St. Bartholomew’s Church in New York City, got to know both Clark and Whipple during his time in Kansas. The two lawmakers say getting to know each other as fellow Episcopalians has helped them see each other as public servants both motivated to make Kansas better despite aligning with different parties. This story is very encouraging. While trying to understand the factors that led to Trump’s election, I’ve grown more and more convinced that the greater challenge facing us as Americans is learning how to talk with and listen to each other, especially those with whom we strongly disagree. I’m grateful that Rep’s Clark and Whipple are doing exactly that. Thank you for this encouraging article on Reps Clark and Whipple. They are an example of how to people, living their faith, can find common ground. I hope they are inspiring others in their legislature to also seek common ground with each other. We are challenging on a daily basis to not give in to despair over the partisan shouting and intolerance, not not retreat in the face of searing hatred of the other. This is when our personal faith is put to the test. I am grateful for my small but mighty parish ( St.Stephen’s in Sebastopol, CA) where we gather in community, committed to living our baptismal vows of caring and service, however we find the opportunity. I am grateful for our Espicopal faith for our common purposes which transcend day to day politics.